by Elizabeth Gilbert. Published by Viking Adult 2013. “Alma lifted her face and saw what was before her – dozens more such boulders…each one subtly different. She felt herself growing breathless. This was the entire world…this was the firmament of the universe, as seen through one of William Herschel’s mighty telescopes…. I for one think that if Gilbert runs out of ideas for another novel she could certainly do well in re-writing high school biology textbooks. This is probably a good segue to point out what I thought were the low points of the book. The first is related to the, um, orchids. Gilbert seems at great pains to emphasize that Alma is not, unlike the mosses, asexual. Alma’s house has a lot of biology books hanging around, so she learns some certain things early on, and from a young age spends a lot of time reading these books in a special dark closet where she delves into self-exploration. Trust me, I didn’t want to mention it on the blog here, but it’s just that Gilbert spends a good bit of time on it, and one just wants to say ok we get it already. Fifty Shades of Moss or whatever. The other doesn’t happen until the very end of the book. As was probably inevitable in a book about 19th century biological exploration, Alma encounters the work of Darwin, A.R. Wallace. Spoiler alert – of course she had written about this same theory of evolution, but is a female, and so on and so forth. This could have gone in a somewhat tiresome direction. 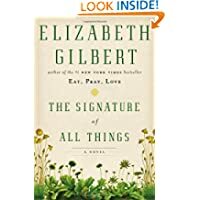 But I think Gilbert redeems herself with one important part: Alma hesitated from publishing her evolution theory not really because she was a woman, but because she thinks the prospect of evolution leaves out the “mystery” of human altruism. Alma cannot account for the goodness and sacrifice of self-interest that she saw in Ambrose and Prudence: “if the natural world was indeed the sphere of amoral and constant struggle for survival that it appeared to be…then what was one supposed to make, for instance, of someone like her sister Prudence?…Alma could answer that question from a moral standpoint (Because Prudence is kind and selfless) but she could not answer if from a biological one (Why do kindness and selflessness exist? )” I was impressed that Gilbert gives this to Alma. This sort of view seems to respect and value a Judeo-Christian view that says, wait: people and our relationships are about more than evolutionary survival. There is something about love for others that is not simply biology, but something that makes us human – something that has, perhaps, to do with the spark of the divine. -As mentioned earlier, at the end of her life, Alma finds she cannot account for altruism in biology/evolutionary theory. It seems to me that Gilbert has presented four viewpoints: 1) Early Alma – reason and rationality behind everything/everything can be explained through scientific processes; 2) bad scientists who use coincidences of biology to ‘prove’ God; 3) bad religion such as people like Ambrose who are spiritual to the point of losing touch 3) late Alma, who believes firmly in her evolutionary theory and loves moss dissection but finds that there is something mysterious and unexplained about human relationships. So between Goldstein’s book, Spinoza background in general, and Signature, I think there’s more than enough to work with here for a Jewish book club session. Whatever associations and conclusions one wants to draw between this article and Gilbert’s book, I suspect that a bowdlerized Hollywood version of The Signature of All Things with Roberts or anyone similar, would not do anyone any favors. *Also, I think there’s a gentle current of pantheism running the book – not only do various characters express wonderment at the order of the natural world, but the title implies a sort of divine stamp in every aspect of nature – and whether or not Spinoza himself was a pantheist, later pantheistic writers drew heavily on his work. According to Goldstein’s book, Spinoza believed not only that “God is immanent in nature, not transcendent” but also that “the difference between right and wrong is immanent within our human nature.” For Spinoza, “logic is sufficient to reveal the very fabric of reality.” I think Gilbert’s Alma believes this for most of her book/life, but certain people and her relationships with them bring her to question those early beliefs.